What is Glassdoor serving its customers? Glassdoor is owned by Recruit Holdings Co., Ltd., based in Tokyo, Japan. Still largely unregulated, leading recruitment advertising companies like LinkedIn, Indeed, ZipRecruiter and Glassdoor, among others, imply their services deliver benefits that no rational person believes are possible — while job seekers nonetheless swarm those sites like flies drawn to the nutritious scent of dung. Everyone knows it’s phony marketing. But everyone excuses it as par for the course. 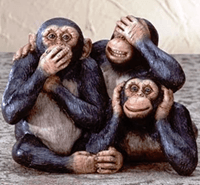 And the employment industry banks on this contradiction between what consumers know and what they tolerate. Hapless users routinely excuse the wild marketing claims and unforgivable sales tactics that now seem to define America’s employment system — which is now embodied in this small handful of online recruitment advertising firms. Frustrated job seekers have become numb to wasting their time and money — because employers openly endorse and participate in a shameful system of recruiting and hiring that challenges credulity. It’s shocking the law has not come down on employers and an employment industry that together manipulate the information a nation relies on to fill jobs with workers. The latest example is an expose of the leading repository of “company reviews” that job seekers grudgingly rely on when deciding where to go work next. We’ve discussed the problem of data gathered from anonymous sources before. 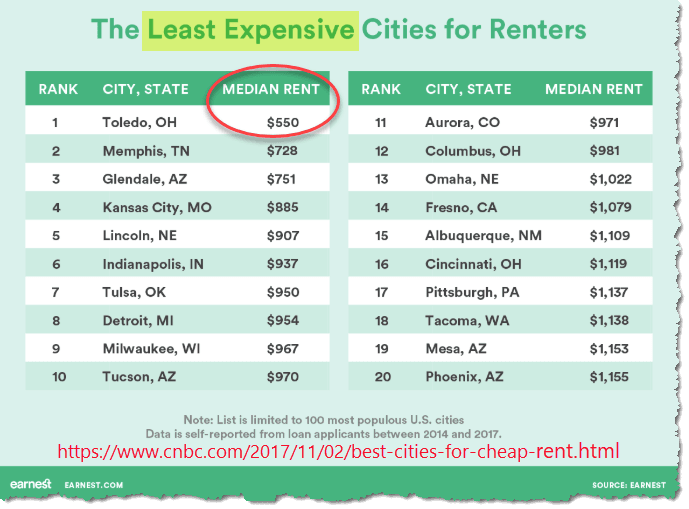 In Glassdoor Salary Data: Worse than useless we looked at how Wired magazine’s Rachel Nuwer reported a simple test that shattered the myth of Glassdoor’s vaunted salary surveys. We saw that the “self-reported” salary information published by Glassdoor — if relied upon for salary negotiations — could cost a job seeker an additional 69% worth of compensation, according to Wired. When Glassdoor’s slap-happy anonymous data is compared to rigorously vetted salary data gathered directly from employers, it seems the job applicant stands to lose. Last week, the Wall Street Journal released a damning report that addresses what skeptical job seekers have long been asking: Is wrong information being given out at Glassdoor, the employee feedback site where anonymous people rate the companies they work for? 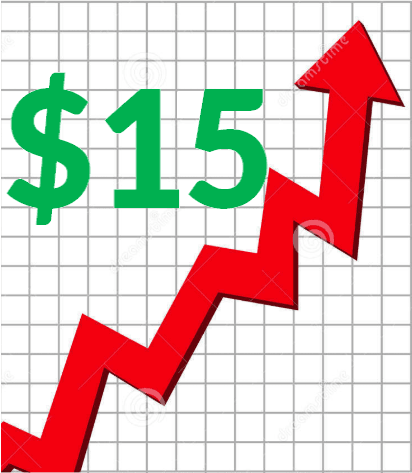 Says the Journal: “Glassdoor’s company ratings are a powerful weapon in job recruiting, giving companies an incentive to inflate them.” And inflation is what the analysis found. The power of Glassdoor and its impact on the American job market and economy cannot be underestimated — nor can the import of the Journal’s findings. The Journal found that many employers take special measures to try and manipulate their reputations by “encouraging,” “galvanizing” and “pressuring” employees to post “five-star” reviews. But the question is, what liability does Glassdoor have for it? No amount of rationalizing (“Well, I take the reviews with a grain of salt, but I rely on them anyway.”) excuses a job seeker’s reliance on company reviews that were prompted by the reviewer’s employer. And when we see how and why those reviews were prompted, Glassdoor’s entire database of reviews takes on the smell of a barrel of fish that includes maybe a few — and maybe a lot — of rotting dead ones. A concerted conspiracy to manipulate recruiting? You can and should read the analysis for yourself. But let’s look at the screaming evidence of manipulation behind the “spikes” in five-star company reviews on Glassdoor. 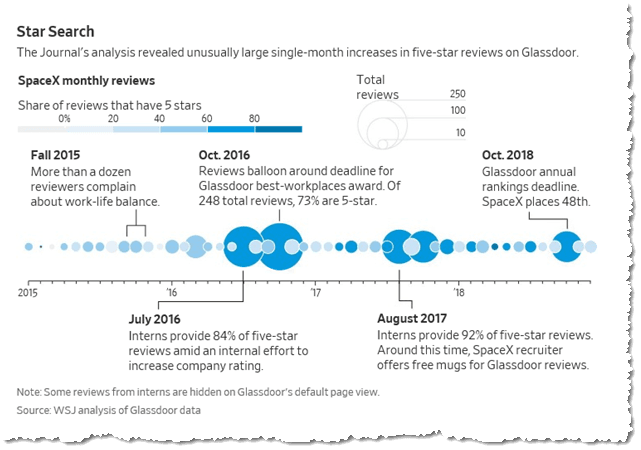 The Journal reports that its analysis “identified over 400 companies with unusually large single-month increases in reviews” that statistically seem to be related to efforts by those companies to boost their ratings on Glassdoor. Is this a concerted conspiracy to improve recruiting by manipulating companies’ reputations among job seekers? Can a company with serious employee relations problems make itself seem like a sweet place to work by encouraging, pressuring and rewarding “target groups” of its workers for juicing reviews on Glassdoor? The Wall Street Journal seems to imply that employers are gaming Glassdoor’s company review system, but the Journal’s analysis actually seems to reveal that Glassdoor is in on the game. Let’s look at what the Journal tells us. Which companies are jamming the frammitz? The Journal delivers details from its analysis of “roughly 8,500 companies with the most Glassdoor reviews” and calls out these specific companies — among 400 it claims had suspicious spikes in their reviews. What did over 400 companies do to “spike” their reviews? The Journal inquired about how the review spikes occur, mostly around each October, when Glassdoor hands out its “Best Places to Work” awards. Say what? Internal encouragement? Do you mean like this? 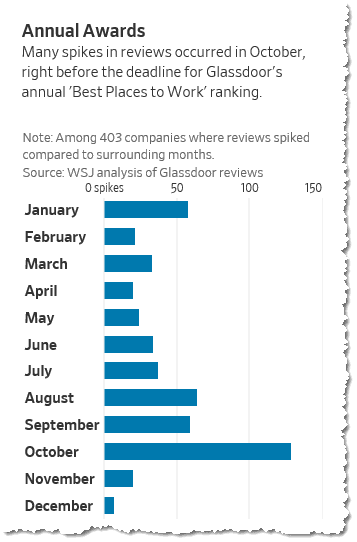 The investigation revealed that reviews “balloon” around the annual October deadline for Glassdoor’s Best Workplaces award. Hey – No free mugs! Glassdoor’s warnings, employers’ branding campaigns, and rewards for employees to post five-star reviews collide while Glassdoor seems to turn a blind eye. Who pulled off this 15X increase in 5-star reviews at SpaceX? Do you know where to list accomplishments on your resume? Oops. Forget you ever heard about those free mugs. It seems Glassdoor did. Does Glassdoor do anything to prevent “spikes” in 5-star reviews? But there’s no mention of what measures Glassdoor has in place to maintain the integrity of reviews. If Glassdoor is the innocent while its corporate customers are gaming it, then how does the Journal explain this? How does the Journal explain taking money to boost an employer’s reputation? Is Glassdoor encouraging “spikes” in 5-star reviews? “Each year, Glassdoor drives traffic-and a flood of reviews-to its site by ranking hundreds of companies and CEOs in the U.S. and four other countries.” This is Glassdoor’s “Best Places to Work” ranking. Could that be Glassdoor’s way of (Wink, wink! Nod, nod!) encouraging its customers to cause sudden spikes in their company ratings? Do 5-star reviews pay off? Is it time for an award? Millions of job seekers swarm Glassdoor for salary data and “reviews” of employers, seemingly convinced that millions of Glassdoor users — including employers and HR professionals — can’t possibly be wrong. But the Wall Street Journal’s investigation of Glassdoor’s and employers’ practices has revealed a stink unrivaled in the employment industry. The only prudent conclusion one can draw from the Journal’s analysis of millions of reviews about over 8,500 companies on Glassdoor is that Glassdoor is crack for Human Resources departments that need a powerful stimulant to make their corporate reputations feel better — at any cost. The Journal seems to have revealed a pervasive public relations manipulation whose objective is to game reputations. Perhaps not surprisingly, a search of the websites of a dozen leading HR associations one week after publication of the Journal’s report doesn’t turn up any articles about it. Notably, SHRM (the Society For Human Resource Management) seems to have posted nothing about the matter. Glassdoor itself has published no response or comment on its website, and does not list the Journal’s article on the “Here’s what others are saying about us” section. Glassdoor is not in business to deliver honest, accurate, valid, reliable salary information and “reviews” of employers. If it were, it would immediately require reviewers to disclose their identities and to be accountable for the salary information and employer reviews they post. The excuse that people won’t post honest reviews if they must disclose their identities rings hollow, now that we know the outcome of permitting anonymous reviews. Glassdoor is in business to generate as much site traffic and revenue from employers as it possibly can. Absent regulations that would force the company to validate the data it sells, and to refrain from tacitly and explicitly permitting, encouraging and rewarding its customers for gaming Glassdoor’s ratings system, job seekers have no reason to expect Glassdoor can or will help them make sound decisions about where to work or how to negotiate job offers. The shocking failure of Glassdoor to ensure the validity and reliability of information it sells to employers and job seekers alike reveals a business model run amuck amidst gullible — nay, stupid — users who really, really want to believe they cannot seek out honest, legitimate information about the reputations of employers on their own. Why do the work, when automation will deliver answers for a price? The chance that any information found on Glassdoor is dishonest is much greater than zero. In fact, based on the Wall Street Journal’s investigation, it is more likely than not that information being given out at Glassdoor is dangerously tainted if not simply wrong. No one — not employers and not job seekers and not any company’s employees — needs the anonymously generated, unaccountable information Glassdoor sells, because it is too likely to be worthless or dangerous, and too likely to distract people from the all-important task of making their own sound judgments based on real interactions with other people who are personally accountable. The business world — especially the HR profession — doesn’t think there’s really anything wrong with what the Journal found. Do you buy what Glassdoor is selling? How do anonymous company reviews affect employers, job seekers, the job market and our economy? Does anybody care — or is this just the way it’s going to be? 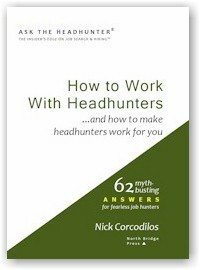 In the January 22, 2019 Ask The Headhunter Newsletter a reader asks whether negotiating a good job offer would be crazy. I’m a Senior Data Scientist and I just got a job offer, but the salary is about $1,000 lower than I expected. It’s a management position with less than a dozen staff reporting to me. They also offered a very generous signing bonus of about $50,000. I think the salary offer is so low because in the interview I was bad at white boarding, and they told me that. But I explained that other skills like machine learning are far more important in this position, and they agreed that’s one of my key strengths. Obviously they agreed enough to want to hire me. I understand they’re using the signing bonus to hedge their risk, but I still want to negotiate the salary. What do you think? In this situation, how crazy is this idea? Thanks! Harvard Business Review has called Data Scientist The Sexiest Job Of The 21st Century. Forbes reports it’s the best job in America. Does that make you worth a lot? Probably. Does that mean you should be greedy? Absolutely not. Don’t let your market value go to your head, and do not discount the judgment they made about your white boarding skills. The value of data science depends on the kind of business in which its practiced — something I don’t know in your case. (Is it marketing? Is it financial services, or consulting?) Apparently the value of white boarding is higher than you think, or this employer would not have made a point about it. Would you turn down the offer? I think you should ask yourself this question: If you tried to negotiate and they were not to budge on the salary, would you still accept the job? If you would, then I would not bother negotiating for a $1,000 increase. Given the size of the starting bonus, I’m guessing the salary offer is way over $100,000. 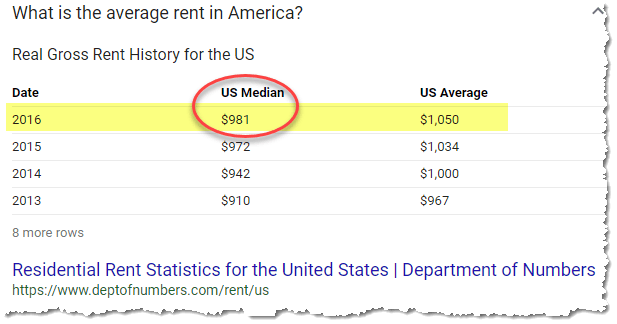 That means the $1,000 is a bone of contention of less than 1%. This is what I refer to as One big negotiating no-no. In a moment, I’ll tell you why it’s risky to be greedy. But let’s put the $1,000 aside for a moment, because it’s still important to consider two of the key issues in any job-offer negotiation. Is this a good place to work, and are they demonstrating that they really want you? Is the compensation enough for you? First, what I really mean is, Do you really want this job? Do you want to work with these people? If you don’t, then don’t do it for any amount of money. If you do, then calculate the future value of the job and the cohort you’ll join. (See It’s the people, Stupid.) 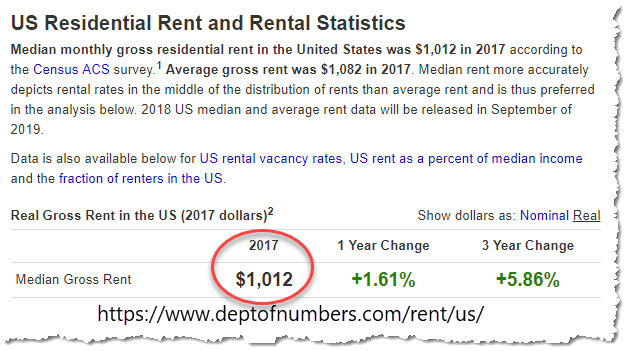 Then ask, What does $1,000 mean in this context? Second, what I’m telling you is, If the salary offered is not going to make you happy, then negotiate the offer or reject it. That’s how I’d judge the offer. Now let’s focus on your particular case. It doesn’t seem the offer is inadequate — not if the difference is less than 1%. While that $1,000 may mean a lot to you — and I don’t mean to disparage your concerns –, I also have to be blunt: I think you’re being greedy. It seems to me you’re discounting the quality of the company and the people you’ll be working with. I’d focus my energy on how good a working environment this would be for you. That’s one key. I agree the signing bonus is generous. Of course they’re hedging their bet — but it still indicates how much they want you. You’re wise to consider that a signing bonus is a one-time payment that will not affect future raises, your 401(k) basis, or other salary-based perks. But you’d have to work 50 years at a $1,000 higher salary to match that one-time bonus. And as my accountant would point out, if you invest that lump sum for the next 50 years, you’re effectively getting a raise every year on it. So the compensation package is another key — and it sounds quite good or you would be looking for far more than $1,000. If you would not accept the salary unless it’s $1,000 higher, then by all means negotiate and be ready to reject the total offer. It’s not my place to tell you what this job is worth. If the hiring manager asked my advice, here’s what I’d say: After you showed this candidate good faith worth $50,000, the candidate is demonstrating a preoccupation with $1,000. That’s not good faith on the candidate’s part! I usually side with candidates who believe they’re worth more money. But in this case $1,000 doesn’t constitute a meaningful negotiation. It’s chump change. I don’t think it’s worth jeopardizing this offer. If you invest that signing bonus at 2%, you’ll get the grand without negotiating anything. 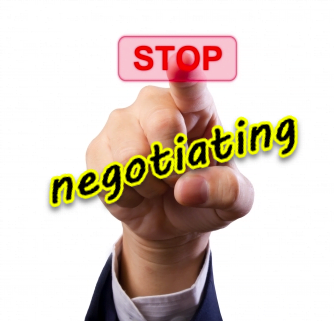 Knowing how to negotiate effectively includes knowing when to stop. So let’s return to the key question: If they were not to budge on the salary after negotiations, would you still accept the job? If yes, then I think risking the job for a grand is indeed crazy. If other key aspects of the job are satisfactory and you want it, thank them for their offer and generous signing bonus, smile, and tell them you plan to demonstrate so much value to their business that next year they’ll want to give you a substantial raise. How much more is worth negotiating for? Where do you draw the line? What’s your biggest negotiating win? Did you ever negotiate yourself right out of a job offer? What’s Better: Quit or get fired? 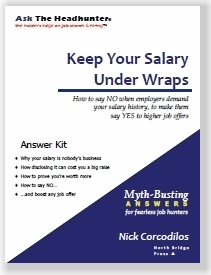 In the January 8, 2019 Ask The Headhunter Newsletter a reader wants to quit or get fired. If a person has a choice, what’s better — to quit a job or get fired? 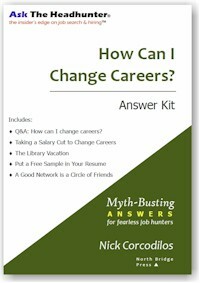 Some suggest that the answer is obvious — quitting is better because then you won’t have a record of being fired. Who wants to say they got fired or terminated? And who wants to explain why they got fired? Some companies that want to fire you will “give you the opportunity to resign instead,” implying they’re doing you a favor. It’s a common pitch offered by an HR manager. But it can be a sucker punch, especially if you’re losing the job through no fault of your own; for example, the company is experiencing a downturn. In all of the 50 United States, if you quit your job you likely forego unemployment benefits because you chose to leave. When you quit, the employer saves money. 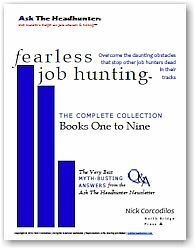 According to NOLO, whether you can collect unemployment may depend on the reason you quit. 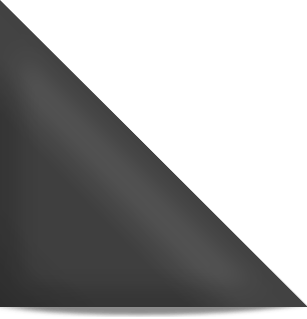 (Unemployment Benefits: What If You Quit?) That can be a hefty price for quitting. 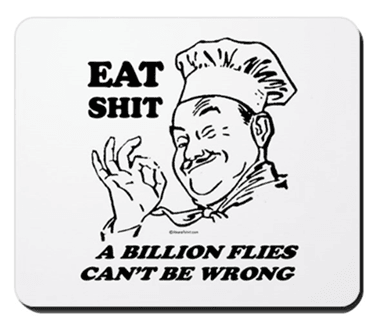 I might prefer to get fired if I have a choice, and that’s not just because I might lose unemployment benefits. Many people shudder at the thought of having “fired” on their record. But that record is not public or easily accessed. An employer that fired you is usually loathe to disclose it during a reference check for fear of getting sued. So I’m not sure your record will be a problem. However, if you got fired because you did something really bad, or because you did a truly lousy job, you have a very different problem — a bad reputation. A bad rep will grow and grow and follow you around. Employees with bad reps may not be exposed via formal reference checks, but back-channel chatter about them will likely circulate. Some employers are known to be terrible places to work. Getting fired can be a badge of honor. Emotionally, it might even be empowering. And it might even signal to a competitor that you’re a nice catch! If you’re going to explain being fired, keep it brief and focus on what you can do to help the new employer — and why you are worth hiring. But don’t worry so much about getting fired. It’s not the end of the world. See Fired for my ethics! If you get fired, your job is usually instantly over. If you quit, you likely are stuck with giving two weeks’ notice. Notice the difference. That’s time you could spend looking for a job you really want, or time on vacation to regroup. I’m not suggesting you go out of your way to get fired — but if you don’t really want to quit your job, don’t let getting fired scare you. If you quit a job, it’s your choice. If you are unwillingly terminated, you may have legal recourse. For example, the action may in fact have been discriminatory or it may have been done in violation of some law or written company policy. If you’re going to get fired, consult an attorney. Know your rights. You might not have that option if you quit. First, you don’t have to admit anything. (Of course, you should not lie. Declining to answer a question is not lying.) Why you left a job is private — and I think that’s a legitimate answer. Yes, they can reject you. But if you fear you’ll get rejected anyway because you were fired, why disclose it at all? Take your chances on a different approach! What really matters is whether you can prove that this employer needs you. If you are a highly desirable hire, all kinds of factors can be put aside, including why you left your last job. So please hear me: What matters is demonstrating that the employer needs you. That’s the negotiating position you want to cultivate. See Stand Out: How to be the profitable hire. Now comes the fun part that frantic job seekers are too nervous to realize. The odds that the manager interviewing you has also been fired at some time are greater than zero. Most managers understand that getting fired doesn’t necessarily mean you did something wrong or that you failed at the job. It might have been a poor match; the company might have experienced a downturn; there may have been a personality mismatch with the boss; or, the company that fired you might be — yes — inept. So, politely ask the hiring manager, “Have you ever been fired?” If you’re afraid to ask that question, then you probably aren’t ready to have a job interview. This is a serious business exchange where you must ask questions as tough as the manager is asking you. Such a candid discussion can be a great way to break the ice and find common ground. 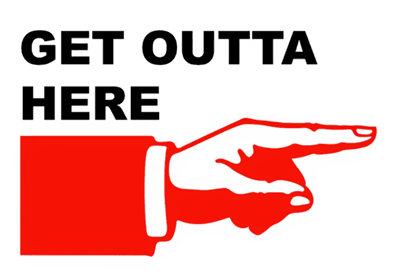 Whether you quit or get fired, check these tips about how to handle parting company with your employer: Quit, Fired, Downsized: Leave on your own terms. Would you rather quit or get fired? Why? What are the upsides and downsides people should consider?